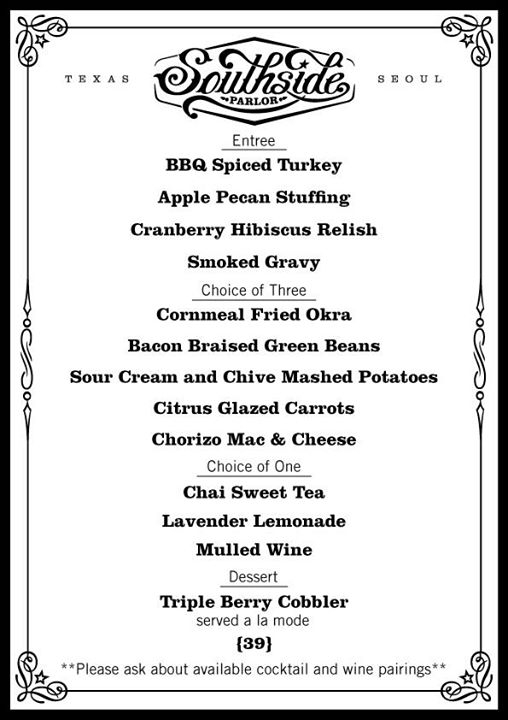 It's that time again for our annual Southside meat and three Thanksgiving feast! We've got another awesome menu filled with made from scratch, finger lickin' goodness. Come join our family for a realxed evening of delicious Southern inspired delights. If you'd like to join us please click JOIN on the event page and RSVP with your NAME, NUMBER, PARTY SIZE and TIME SLOT you'll be attending to SOUTHSIDEPARLOR@GMAIL.COM, WRITE on the event wall or PM our FB page. Looking forward to a good case of the itis afterwards!